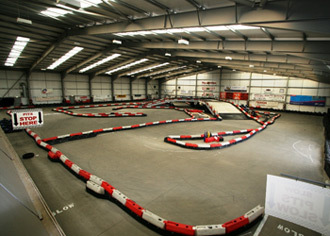 Close to Edinburgh this is possibly one of the best indoor kart circuits we have seen. The attention to detail is spectacular and the premises are very, very well looked after. It has a 5-star rating from the local press, which looks well-deserved. Head west on Weir Street toward Vicar Street/A803 then turn right onto Vicar Street/A803. At the roundabout take the first exit onto Garrison Place/A803 and continue to follow A803 bearing right on to Cockburn Street/A803. Continue to follow A803 and go through two roundabouts then at the next roundabout take the second exit on to Stirling Road/A9. Turn left toward Lochlands Avenue, Continue straight on - Destination will be on the right. Practice, five qualifying heats plus the top drivers in a grand final. A 45-minute team endurance event. Qualifying to determine your grid position then a non-stop 45-minute relay event for teams of 2 drivers sharing a kart. A range of events to suit groups of all sizes from a Mini Grand Prix up to a full-on team endurance race. Let us know your requirements and leave the rest to us!